Gretchen McCullough is a true WT, a world traveler. Raised in Harlingen, Texas, right on the border with Mexico, McCullough took a BA at Brown University in 1984, then taught in Cairo in a school for girls from ’85 to ’87. She followed this with two years teaching in Turkey, then two years in Japan. McCullough came to Tuscaloosa in 1991 and, after receiving the MFA in fiction writing in 1995, taught for two years here, then as a Fulbright lecturer in creative writing in Syria. In 2000 she took her present position with the American University in Cairo. 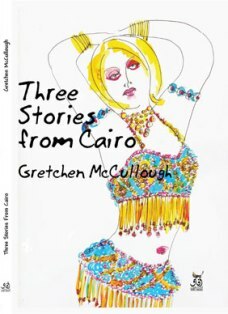 Not cloistered in a comfortable Midwestern college, McCullough, now fluent in Arabic, is a writer with a lot of life experiences and material for her fiction, much of it exotic, even fantastic. This is the world of 1001 Arabian Nights, where not everything is what it seems. These three stories, all set in Cairo, make use of some of these experiences and exude a sense of the magical. The first story is told from the point of view of Keiko, a Japanese girl in Cairo preparing to return home to teach Arabic to businessmen in Tokyo. The apartment above her is supposed to be empty, but Keiko hears noises. Cairo is noisy. Of course the Bawab, the super, tells her she is imagining things, especially “drilling” noises. In fact, the key has been rented, loaned, and copied so often that there actually is a woman up there sewing belly dancer costumes. A part-time prostitute uses the place as does a young man. In a flight of fancy, McCullough describes a herd of cats who congregate there, complete with dialogue: “Fat Louie played the piano. Sasha played the drums.” Everyone lies to the foreigner. No matter. She will leave soon. In “Taken Hostage by the Ugly Duck,” Hada, an uptight conventional housewife disappointed with her own life, is scandalized by the British gay man across the alley. He is often naked, entertains young men, makes a lot of noise. To retaliate she buys, inexplicably, a great blue heron that “yaws” noisily at him. He counters by buying a parrot that sings, loudly, “Wait a minute, Mr. Postman,” and “I’m on the top of the world, looking down on creation.” When the flat across the alley goes silent, Hada misses the excitement and even imagines foul play. “The Story of Fresh Springs” is a murder mystery, sort of. Two young women, Pomegranate and Peach, are murdered. Detectives Hawks and Falcon are on the case. In time, a virile young man, “Superboy,” a kind of acrobat, is arrested probably wrongly, since it seems he has really been using his athletic skills to climb up trees and into the bedrooms of willing, bored housewives. Like McCullough’s other stories this too ascends into the metaphorical/fantastic as the detectives quell crowd unrest by threatening to let loose a pack of cross-eyed Chihuahuas, trained to chew off the big toes of protesters.